Last year in New York Acer launched a pretty stonking little convertible Windows 8 tablet with keyboard dock, the Switch 10. 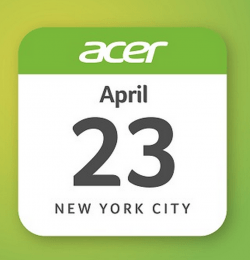 This year Acer has lined up another big launch in the Big Apple however having launched their Liquid Z220 and Z520 at Mobile World Congress the potential for what they are about to release is fantastic! We saw a sneak preview last year of the Jade and their Leap fitness tracker and most were pretty impressed alongside a range of handsome, affordable tablets and notebooks. With Acer it could be anything, this is what makes things so potentially exciting. What would you like to see from Acer this year? An update to the Switch 10 or Switch 11? A high end Acer Android phone or tablet? Tune in for The Mobile Tech Addicts Show on Thursday evening at 20:30 GMT for a discussion.